Carnarvonshire: Aber, Bangor (4), Llandegai (3), Llanfairfechan, Llanllechlid (3). Anglesey: Beaumaris (3), Llandaniel Fab, Llandegfan, Llandonna, Llandysilio, Llanedwen, Llanfaes, Llanfair-pwll-Gwyngyl, Llanffinan, Llanfihangel Esceifiog, Llanfihangel-tyn-Sylwy, Llangoed, Llaniestyn, Llansadwrn, Penmon, Penmynydd. The population falling within the union at the 1831 census had been 19,972 with parishes ranging in size from Llanfihangel-tyn-Sylwy (population 62) to Bangor itself (4,751). The average annual poor-rate expenditure for the period 1834-36 had been £6,452. In 1838, the Poor law Commissioners autheorised the expenditure of £3,800 on the construction of a union workhouse. However, in Bangor as in many other Welsh unions, there was little enthusiasm for the new workhouse system and it was not until September 1845 that the building was ready. The workhouse, designed by Messrs Weightman & Hadfield, was erected on a site at the east side of the Carnarvon Road at Glan Adda to the south-west of Bangor. Its location and layout are shown on the 1900 map below. Bangor and Beaumaris workhouse site, 1900. The workhouse adopted a somewhat unusal H-shaped layout with a long, possibly corridor-plan main block, with narrower cross-wings to each side. The master and matron in 1901 were William and Mary Jane Davies from Llanelly. 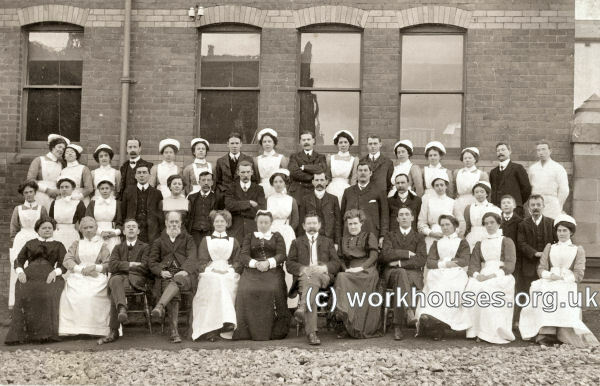 There are believed be at the centre of the front row in the picture below of the Bangor workhouse officers and staff. Bangor & Beaumaris workhouse officers and staff, early 1900s. After its closure in 1930, the main workhouse site became a creamery. The workhouse buildings have now been demolished and a supermarket occupies the site. In 1914, a large new workhouse infirmary was erected at west side of the Carnarvon Road, a little to the north of the main workhouse. However, with the onset of the First World War the buildings were taken over for use as a military hospital. The site later became a maternity and childrens hospital known as St David's' Hospital but closed in 1983. Bangor and Beaumaris workhouse and infirmary sites, c.1914. 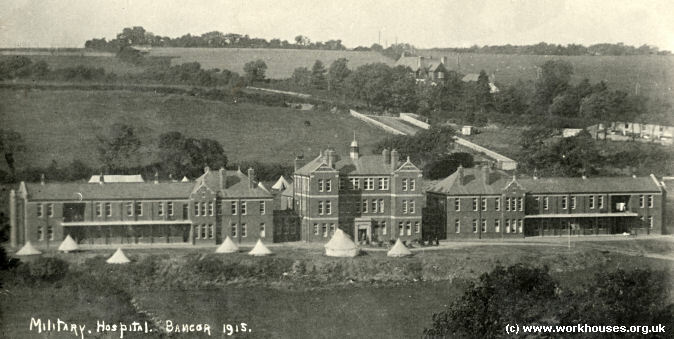 Bangor & Beaumaris military hospital, c.1915. In 1914, a large new workhouse infirmary was erected at west side of the Carnarvon Road, a little to the north of the main workhouse. However, with the onset of the First World War the buildings were taken over for use as a military hospital. The site later became a maternity and childrens hospital known as St David's' Hospital. The hospital closed at the beginning of 1994 and a large retail store now stands on the site. In around 1905, the Bangor & Beaumaris Union established the Maesgarnedd Home for children at Llanfair PG. In 1924, the home could accommodate 12 children, with E. Swain as its Superintendent. Anglesey Archives, Industrial Estate Road, Bryn Cefni Industrial Estate, Llangefni, Anglesey LL77 7JA. Holdings include Guardians' minute books (1837-1858, 1904-30); Admissions/discharges (1920-1932); Births (1846-1938); Deaths (1901-19); etc. Paupers in Reciept of Weekly Relief, June 24th 1881 (Bangor Civic Society website).